Coconut water is a very common drink. It is available almost in all the seasons. In Asian population coconut water is considered very luxurious. Most of people consume coconut water only when they are ill or when women are pregnant or sometime given to kids who are weaker comparatively. This clearly states that health benefits of coconut water are great and hence they are given when the individual is in a state where there is high requirement of nutrients. Coconut wtaer is highly rich in minerals and therefore its considered to be very beneficial. Following is the composition of coconut water. 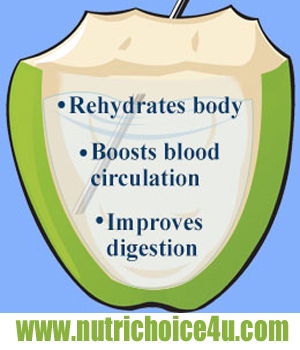 Coconut water is the best hydrating food. It is rich in electrolytes which balances body electrolytes when there is fluid loss in the body due to loose motions, excess sweat, burns, vomiting etc. It has significant anti-ageing, anti-carcinogenic and anti-thrombotic properties which helps to minimize skin aging, balances PH levels and keeps the connective tissue hydrated and strong. It is beneficial to maintain good cardiovascular health as it is rich in magnesium and potassium. It is a best drink when suffering from kidney stones. it helps to throw out stone form the body by alkalizing urine and prevent further stone formation. It gives instant energy. So it is one of the best and natural energy drink. Coconut wtaer is rich is potassium and hence prevents muscle cramps. Makes bone healthy and strong. Coconut oil comprises of Vitamin B like riboflavin, thiamine and pantothenic acid which help to reduce anxiety,depression and stress. 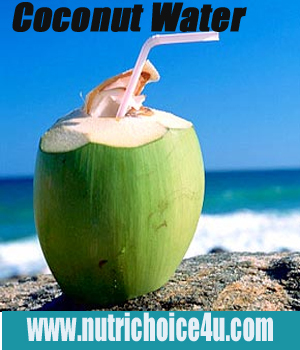 Coconut water also acts as diuretic. It helps in diseases which retains water in the body. Coconut acts as an anti oxidant and fight against all the free radicals produced due to stress, pollution and high calorie diet. 5 Responses to 10 Health Benefits of coconutwater. Mouth ulcers with coconut water cannot be the reason. It might be possible that coconut water is consumed after a long meal gap or empty stomach which may cause gastric discomfort and due to that there would be mouth ulcers. What i would suggest is to have coconut water in first half of the day may be 1 hr after any meal. I don’t even know hoow I endd up here, but I thought this post was great.